We just made another loan to someone in the developing world using a revolutionary new website called Kiva (www.kiva.org). We support Kiva as we believe in their way of making the world a better place: not bound by religions or nations, non-profit. Kiva is about microfinance (small loans), not donations. You can go to Kiva’s website and lend to someone in the developing world who needs a loan for their business – like raising goats, selling vegetables at market or making bricks. We even found somebody selling bicycles! Each loan has a picture of the entrepreneur, a description of their business and how they plan to use the loan so you know exactly how your money is being spent – and you get updates letting you know how the entrepreneur is going. The best part is, when the entrepreneur pays back their loan you get your money back. Then you can withdraw your funds or lend them to someone else. These are not donations, but small loans. Kiva’s loans are managed by microfinance institutions on the ground who have a lot of experience doing this, so you can trust that your money is being handled responsibly. It’s finally easy to actually do something about poverty – using Kiva I know exactly who my money is loaned to and what they’re using it for. And most of all, I know that I’m helping them build a sustainable business that will provide income to feed, clothe, house and educate their family long after my loan is paid back. Join me in changing the world – one loan at a time. The Long Distance Cyclist (BikeTravellers) lending team! We want to recruit you to my lending team, Long Distance Bicyclists. If you join our lending team, we can work together to alleviate poverty. Once you’re a part of the team, you can choose to have a future loan on Kiva “count” towards our team’s impact. The loan is still yours, and repayments still come to you – but you can also choose to have the loan show up in our team’s collective portfolio, so our team’s overall impact will grow! Check out the Long Distance Bicyclists lending team, and learn more about lending teams on Kiva in general, by clicking here. Kiva is the world’s first person-to-person micro-lending website, empowering individuals to lend directly to unique entrepreneurs in the developing world. The below diagram shows briefly how money gets from you to a developing-world entrepreneur, and back. 1) Lenders like you browse profiles of entrepreneurs in need, and choose someone to lend to. When they lend, using PayPal or their credit cards, Kiva collects the funds and then passes them along to one of our microfinance partners worldwide. 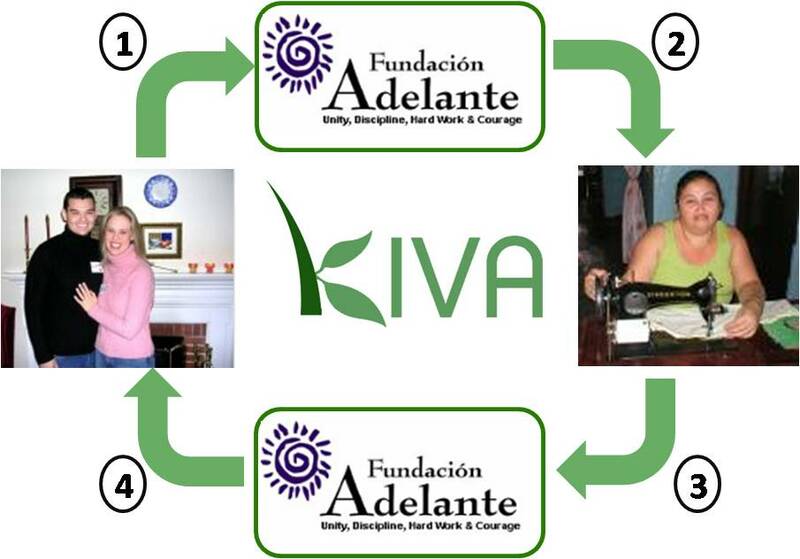 2) Kiva’s microfinance partners distribute the loan funds to the selected entrepreneur. Often, our partners also provide training and other assistance to maximize the entrepreneur’s chances of success. 3) Over time, the entrepreneur repays their loan. Repayment and other updates are posted on Kiva and emailed to lenders who wish to receive them. 4) When lenders get their money back, they can re-lend to someone else in need, donate their funds to Kiva (to cover operational expenses), or withdraw their funds. None of your loan gets used up by Kiva itself. They are paid by grants, donations of 3rd parties, including Lenovo, our laptop sponsor. 100% of your loan gets to the local microfinance partner. When you buy these books, through these links, you will support Kiva (they get a percentage). 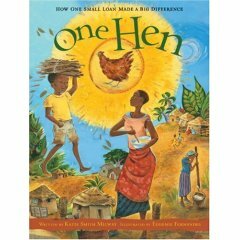 Inspired by true events, One Hen tells the story of Kojo, a boy from Ghana who turns a small loan into a thriving farm and a livelihood for many. One Hen shows what happens when a little help makes a big difference. Naima, a ten-year-old Bangladeshi girl has a series of misadventures while trying to help her family earn money. 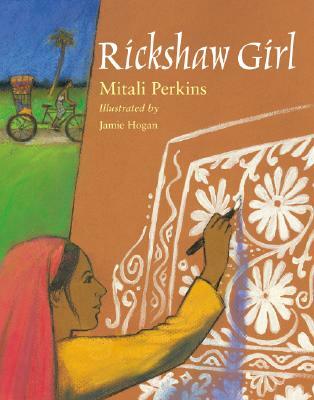 Her talent for painting leads to an unexpected opportunity, while young readers get to learn about microfinance through a colorful woman-owned rickshaw shop. This is a great introduction to microfinance – an easy read which tells, in his own words, the story of how Muhammad Yunus started Grameen Bank (one of the first microfinance operations which is now an independent bank in Bangladesh). Not for the weak of heart – this is a very in-depth book focusing on the economics of microfinance, which is used often as a college text book. The End of Poverty: Economic Possibilities for Our Time, by Jeffrey Sachs. Jeffrey Sachs has a 9 step plan to eliminate extreme poverty by the year 2025. Not directly related to microfinance, but directly related to the reason Kiva facilitates it. A bold manifesto by two business leaders, A Billion Bootstraps shows why microcredit is the world’s most powerful poverty-fighting movement-and an unbeatable investment for your charitable donations. A Billion Bootstraps explains how ordinary people can accelerate the microcredit movement by investing charitable donations in specific programs and then leveraging those contributions so the net cost to lift one person out of poverty is remarkably low.